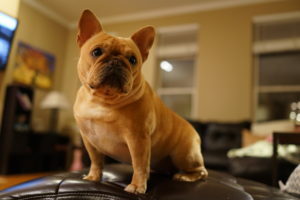 Aside from their lovable, humorous and infectious personalities, one of the many great things about the French Bulldog is the variety of coloring that is available within this breed. Between their variations in color, marking and their varied and distinct personalities you are guaranteed a stand alone, one-of-a kind pup no matter what you choose. 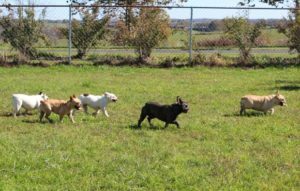 In this blog post we will discuss the differing coloring groups that are found among Frenchies, from the common to the extremely rare. Pied– In addition to Frenchies coming in these beautiful colors, there are pied Frenchies in each of these color groupings as well. 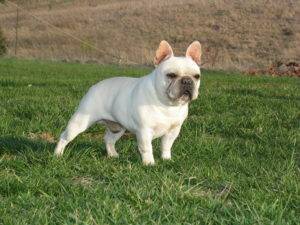 A Pied Frenchie is a white/eggshell colored Frenchie with one or more patches of a darker color. Some pieds are mostly white and have very little of the darker color, sometimes as little as one small patch around an eye, on the tail, etc. 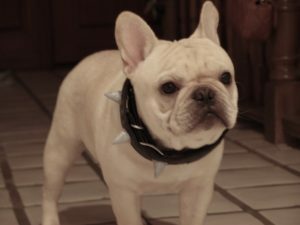 Most pied Frenchies have a few darker colored patches, but with still more white than the darker color. A few Frenchies have large areas of the darker colors on their coats with less white, sometimes much less white, than the darker colors. 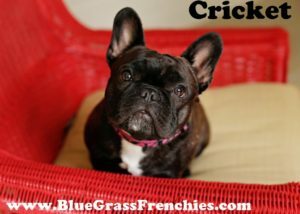 Brindle Frenchies – A brindle Frenchie has a coat that is predominantly a dark color with lighter colored hairs mixed in, sometimes in a uniform manner and sometimes quite random. Brindling (the lighter hairs) may be almost non-existent (called Seal Brindle) to very heavy (called Tiger Brindle or even reverse brindle if there are more lighter colored hairs than dark ones). 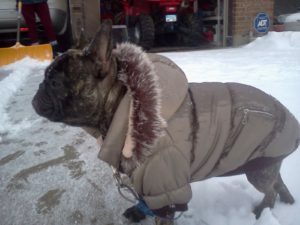 Frequently there are patches of white of varying sizes on the chests of brindle Frenchies, and also it sometimes occurs on the heads, neck areas, &/or toes of brindle dogs. Ceci and Chloe are both Brindle with white blaze on their chest. 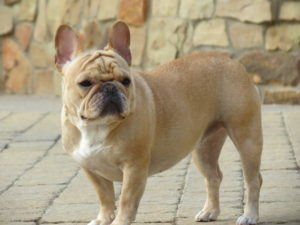 Cream –Cream Frenchies have a uniform eggshell coloration (unless they are pieds, in which case the color patches on their eggshell bodies are a shade of fawn, often with an orangish tint). Fawn – Fawn Frenchies can range from a very light tan to a dark reddish tan and everything in between, and, if you ask us, they are all very beautiful. They do not have any brindling in their coats, but generally most fawns are not completely uniform in color as the tint of the back, sides, and head/ears is often darker than the color of the lower body and legs. Mojo is a fawn with white markings. The white markings can ne on the chest, head or feet. 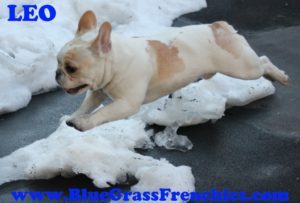 Bear is as white a color as we have had here at BlueGrass Frenchies. The following are extremely rare Frenchie colors that are actually disqualified by the AKC but no less beautiful than the previous colors discussed: Pure black and pure Blue, Jet Black, Black and Tan, and Chocolate and tan, Chocolate & Lilac. Tan points are a lighter markings of tan on the face, feet and hind end of the other colors, like a blue fawn with tan points or a black with tan points. Frenchies having any of these colors and patterns are beautiful, rare, and can be very expensive. 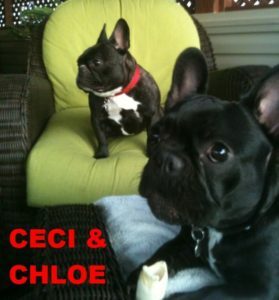 If you have your heart set on a very unique and special Frenchie that only a select few are privileged to own, one of these may be just what you are looking for. 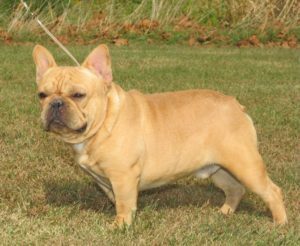 Even though these Frenchies cannot be entered into conformation competitions, they are just as healthy and just as amazing as Frencchies with more common coloration. 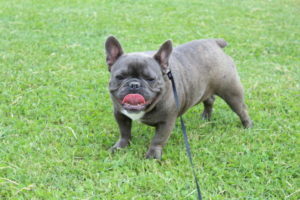 Blue Brindle – The more rare brindles are the blue and chocolate brindles. On the blue brindles pigment on the nose and pads is also a grayish blue in color, and their eyes are generally from a light to a medium brown, often with hints of gold or green (although their eyes are blue up until they are a few months old). Just like black brindles, blue brindles will also have various amounts of brindle to their coats. Blue-fawn – This is a color variation of blue, wherein a fawn coat is diluted with the blue hue being seen most clearly in the masking points on the face and on the upper body. They have grayish colored noses and pads and they generally have light to medium brown to green/grey eyes. These are also very beautiful and rare dogs. 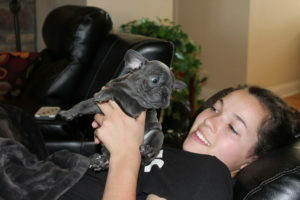 They range in color from a light blue fawn to a dark apricot blue fawn. 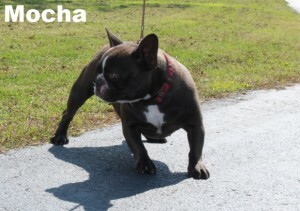 Chocolate – The chocolate brindle is another rare Frenchie color which can range from a light milk chocolate brown to a fairly dark chocolate-brown. Chocolate brindle Frenchies have brown to light brown noses and nails and a variety of gorgeous eye colors which really set them apart, especially the piercing yellow/gold eyes which our chocolate Frenchies have. Their eyes can also be a light brown, green, or hazel. 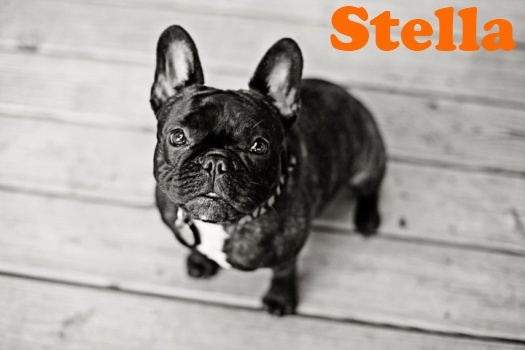 Their eyes are very easily distinguished from the very dark to black eyes of standard brindle Frenchies and even the somewhat lighter brown eyes of blues and fawns. As with all the other brindles, chocolate brindles have varying amounts of brindling to their coats as well. Jet Black- Black coat with no brindling. This coloring can have a white blaze or white markings or be all black. Cricket is a jet black with white blaze. 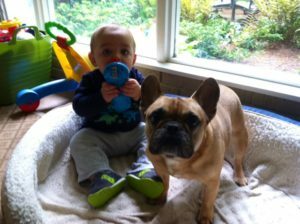 We hope this post has familiarized you with the many varied possibilities when it come to French Bulldog coloration and assist you in possibly deciding if you have a color/pattern preference. Which colors are your favorite?